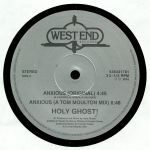 Review: In order to raise money for HIV/AIDS charities in memory of the late, great Mel Cheren, West End Records has recruited former DFA duo Holy Ghost!. "Anxious" is the pair's first single in two years and includes vocal contributions from LCD Soundsystem and Juan Maclean chanteuse Nancy Whang. Their bubbly, wide-eyed, synth-heavy original version comes accompanied by a slightly more driving and dancefloor-focused take by original West End mixer Tom Moulton. Side B offers another chance to enjoy the wild "Long Version" of 1977 West End disco favourite "Spirit of Sunshine" by the Chuck Davis Orchestra, along with an all-new Holy Ghost! re-rub that layers new synths and instrumental flourishes over the original's grandiose orchestration and camp female vocals.